Open source investigations are research intensive, with the largest factor being to find one piece of crucial data in a sea of information. To do that, the open source community relies upon methods and tools to filter and set parameters on the flow of information. In this case study, I have created a custom search engine that uses parameters to locate Google Maps links in relation to any indexed topic. We also look at a way to store that information in a shared worksheet that will automatically plot all points to a map. The materials used in this post are free to use and do not require specialist skills. 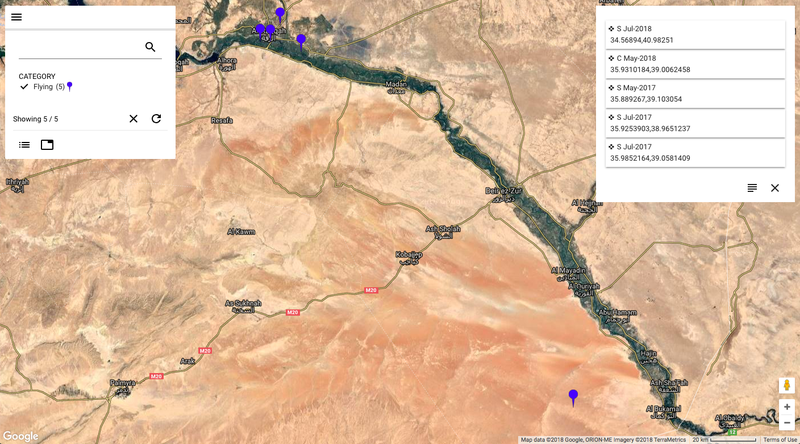 A tool I made to help my own open source information gathering is GEOINTsearch. 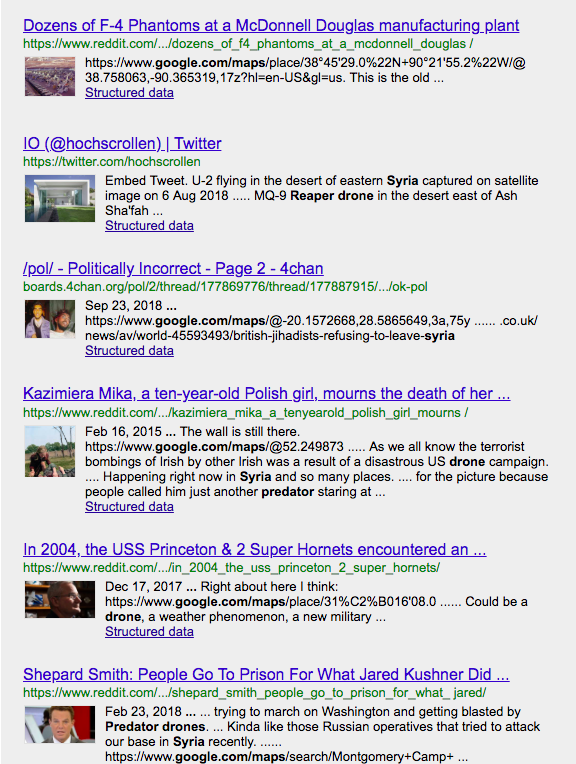 This search engine gathers indexed data from Twitter, Reddit and 4Chan relating to a search query. The search engine has added parameters to filter only links to coordinates on Google Maps. GEOINTsearch allows a user to input a subject, area, city or country into the search engine resulting in map referenced data. In research, these results can be used to gain a geographic understanding of a subject, or to digitally recreate the scene of an area for verification. For open source geo-referenced information, a search filter can be used to find geolocated information. 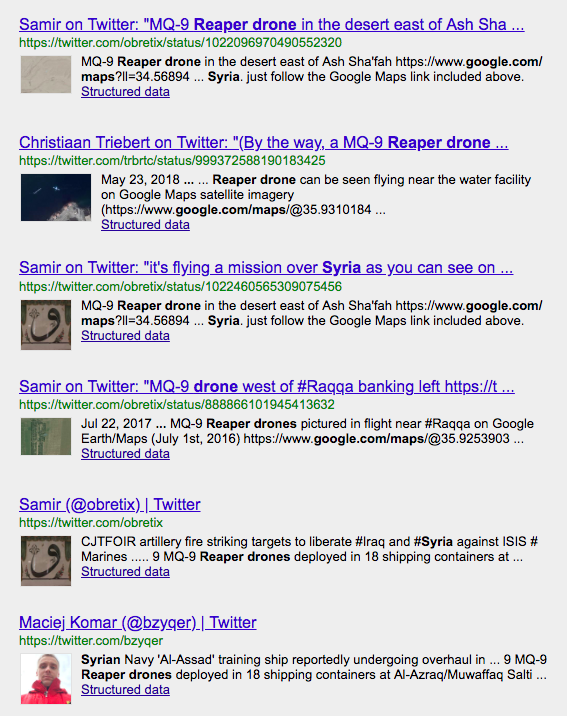 For this case study, I have chosen to look at the collection of geolocated data of MQ-9 Reaper drones in Syria. 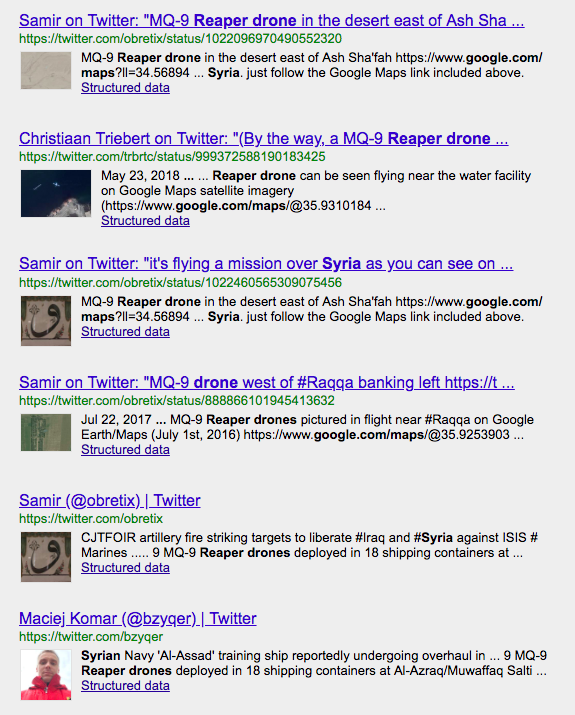 This search query results in geolocation work done by open source professionals to map out the presence of MQ-9 drones in Syria. The search can be used to find map-referencing data in a specific area. 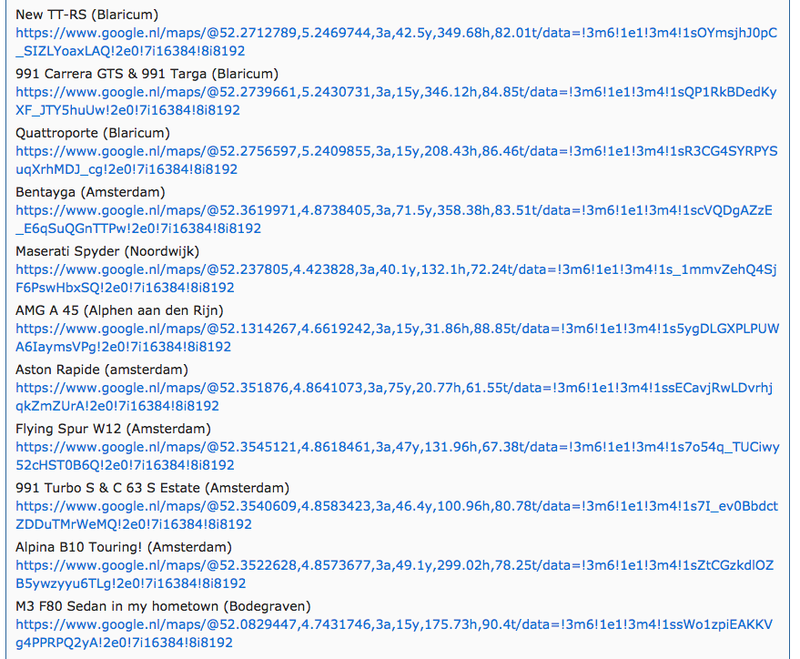 For example, we can run a search on results on Amsterdam in The Netherlands. 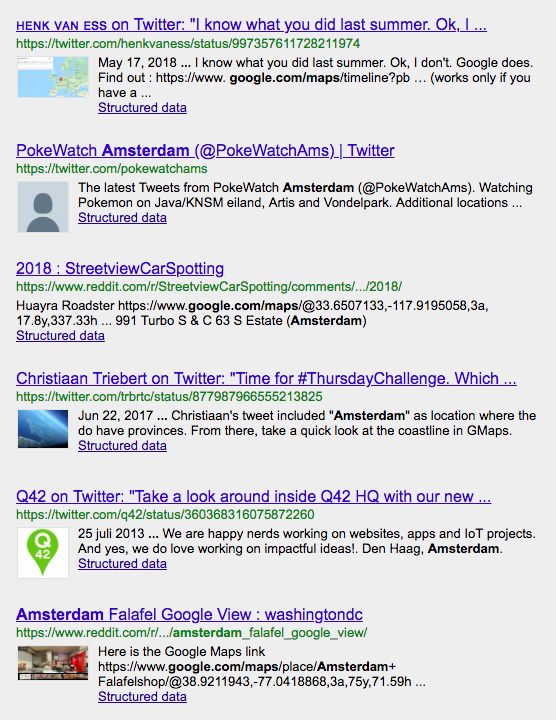 This search delivers all indexed results from Amsterdam. In this search we have someone that compiles links of interesting vehicles on Google Street view. What can we do with all of this information when conducting research? Google Sheets, combined with Mapping Sheets, is an incredibly effective way to organise geo-referenced data. If you are new to these platforms, Google Sheets is the Google Docs of spreadsheets — it allows multiple users to access the same spreadsheet. Mapping Sheets is an add-on to Google Sheets. It provides the function of automatically plotting data from the spreadsheet to a map. 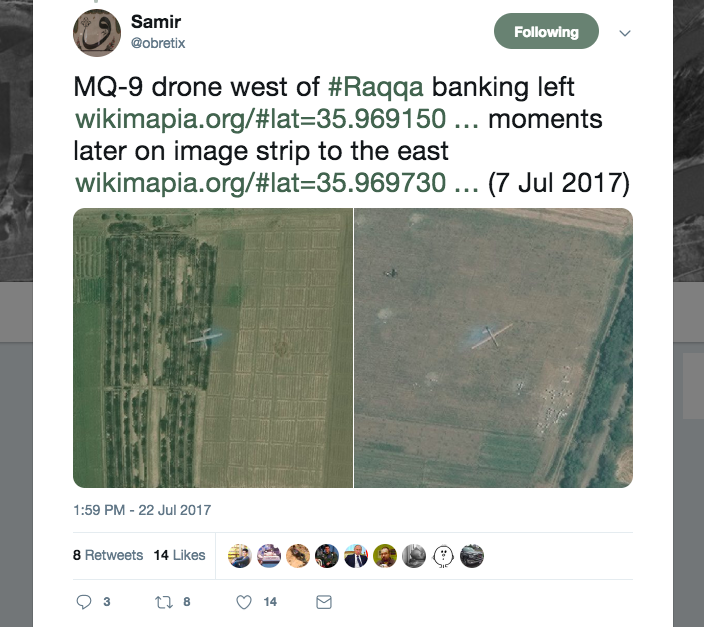 We can see this in action with our case example of the MQ-9 Reaper drones in Syria. First, using GEOINTsearch, we are provided with a number of results from the indexed platforms. To collate this data, the first step is to create the worksheet. When creating the worksheet — use the add on for Mapping Sheets as seen below. Applying the locations to the spreadsheet is straightforward. All we need to do is set up the sheet in a manner that responds to the parameters we set for the map. For this example worksheet, I have included the user that posted the map reference (USER), the status of the drone (CATEGORY), and the coordinates of where it was seen (LOCATION). You can add more parameters to your worksheet as you see fit. For the location — coordinates are advisable to use. To gather coordinates, simply copy the map url, paste it in the address bar, and highlight the coordinates it contains. You can see an example of this below. Paste those coordinates in your spreadsheet. Having plotted some of the coordinates on the spreadsheet, the map function first requires a ‘build’ and then can be viewed. 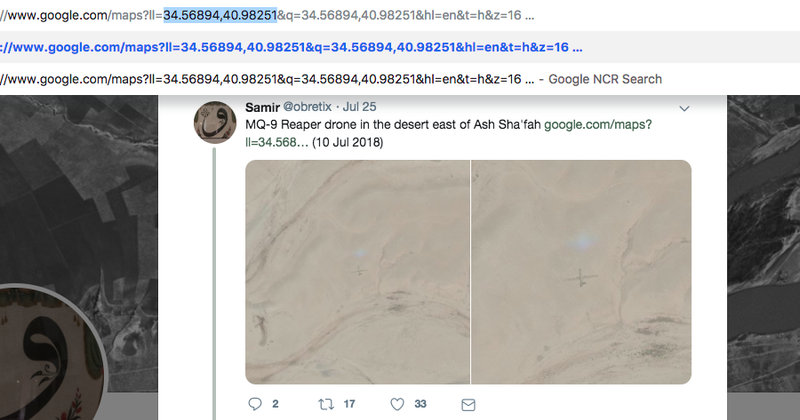 The result is a visualisation of where these MQ-9 Reaper drones have been geolocated, showing a concentration of MQ-9 Reaper drones around Raqqa. Expanding this sheet, using the CATEGORY filter, will allow for more detailed categorisation, for instance, to categorise MQ-9 drones that have been spotted on the tarmac, in contrast to MQ-9’s that have been spotted in-flight. 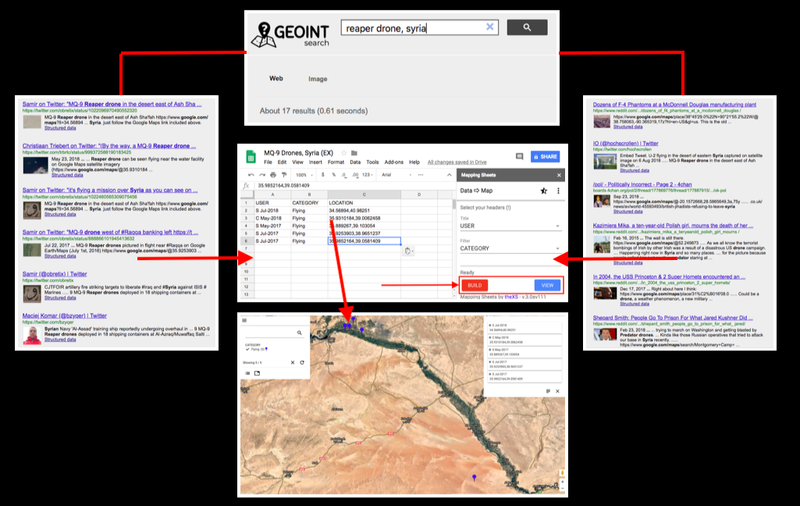 This type of shared work benefits crowdsourced investigations as Google Sheets with Mapping Sheets allows for a thorough visualisation of OSINT work. You may want to create a search engine, similar to GEOINTsearch, for your own information gathering. This is quite simple. 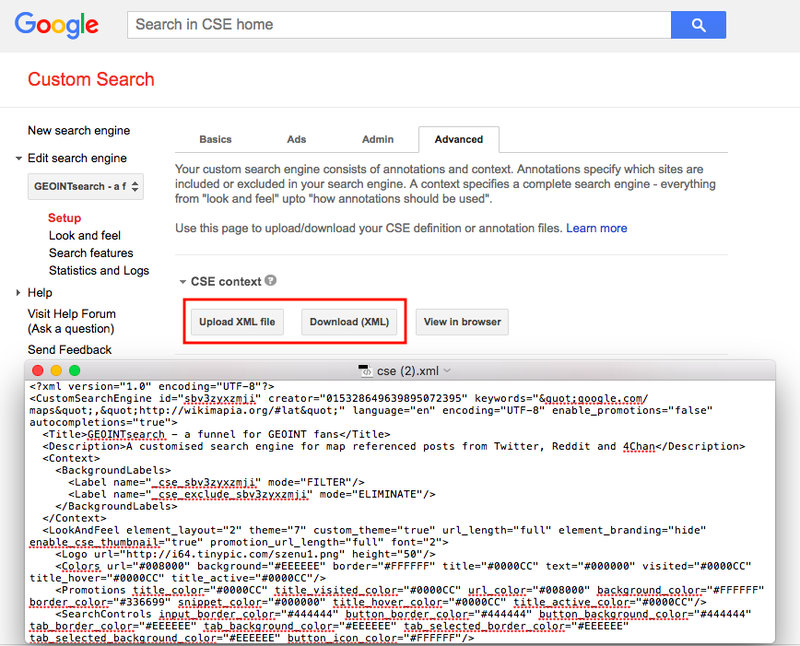 A custom search engine can be freely created on Google’s CSE platform, as seen below. This is useful for any organisation that utilises open source data monitoring and analysis. Creating a CSE is straightforward, and can be customised to any search field. While Google’s CSE platform provides an easy user interface, more freedom to create greater search parameters is done by using Extensible Markup Language (XML). XML controls the transport of data, and a simple knowledge of how it works can be learned through W3schools. With Google’s CSE platform, a search engine model can be built using the CSE base, downloaded as an XML document, edited and reuploaded. Of the open source investigations I have worked on, a majority have been team efforts with professionals and hobby OSINT researchers from around the world. Being able to work on a mutual and crowd-friendly platform, assists many great investigations, with large volumes of data, resulting in open-source finds, and results.